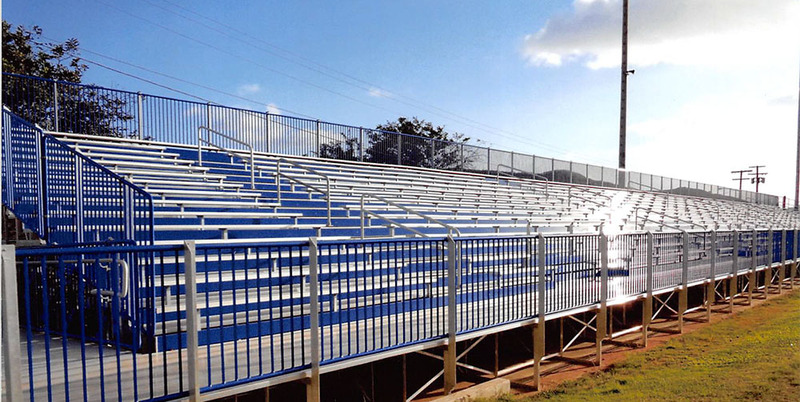 Our High Capacity Bleachers are a unique solution for outdoor bleacher seating requirements. We offer standard series as well as custom designed bleachers with an extensive number of options. Stadium Bleachers - We have experience building full stadium bleachers for Football, Soccer, and Baseball stadiums. We can create a custom solution to meet your budgetary and occupancy needs. We can also build custom Elevated Bleachers and Press Boxes for any situation. Contact us today for a quote on your high capacity stadium bleachers! Grandstands - With experience building both I-frame and angle frame stadium bleachers and grandstands, we can build a custom solution for each unique space. We have built custom stadiums large enough to have concession stands underneath and grandstands using a natural hill as a foundation. Get in contact today for a quote on your custom grandstands!